How the hell did BlackBerry last this long? As a phone reviewer, I can tell you that the BlackBerry loyalist is one of the most vocal of all the smartphone tribesmen - and with good reason. Once upon a time, as I've so often been told, the BlackBerry was the original smartphone. Well, that's not strictly true, but it was one of the first truly mass-market devices and made CEOs cackle with glee at the realisation that they could finally email important documents to executives while they were supposed to be on holiday. But now the news that BlackBerry is open to the idea of being bought out shows that if you don't move with the times, you'll be overtaken and consumed by technological vultures feasting on the juciest bits of your once-cutting-edge carcass. You can trace the problems to before the iPhone launched in 2007. The Quark, all the way back in 2002, was a novel idea that combined email and calling on the go. It was the future, but also the company's downfall. RIM (as it used to be called) had stumbled onto a happy formula, a combination of brilliant keyboards and high-level, secure connectivity. But the mantra 'if it ain't broke, don't fix it' must have been emblazoned on the walls of both RIM CEOs' offices, as the company steadfastly refused to keep pace with change. It eschewed 3G, took ages to add cameras or Wi-Fi to its devices and even managed to mess up the touchscreen when it finally tried to rival the iPhone with the BlackBerry Storm in 2008. Seriously, what's the deal with a clickable display? When I first saw it, I was impressed that someone had tried something different. Then I used the phone for more than a minute and wanted to throw it out a window and go back to my HTC Touch Diamond 2 running Windows Mobile. Windows Mobile. That's how bad it was. And from there, we've seen nothing but a series of missteps from RIM, with the BlackBerry Playbook ('Yes, you need a BlackBerry phone to make it work. What's the problem?') to the ever-more delayed BB 10 OS ('Why has everyone stopped buying our current phones?') that caused tech commentators to melt down as the wait went on and on and on. The sad thing about all of this is that BlackBerry is actually a terrific company. I've been to its research labs and have seen the level of brilliance the company has to offer. It showed that mobile messaging could, and should, be free with BBM. It still makes the best keyboards out there, swimming against a world of faceless touchscreens. Heck, even BB10 is a great product. But it's the great product that should have been here in 2010. I keep thinking about how game-changing that would have been, the iPhone 4 made to look like a vapid glamour model in the face of the powerful new OS with alternative hardware, and BlackBerry users halting in their tracks instead of legging it to a Samsung. 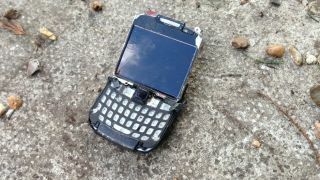 The sad thing about all of this is that BlackBerry is actually a terrific company. But it's too little, too late. There are no budget BlackBerry handsets worth buying. The enterprise market has largely jumped to Android or iOS. Touchscreen keyboards have evolved past the point of really needing a physical keyboard beyond nostalgia. Whoever picks up BlackBerry, I hope they make something of the brand and don't just munch up the patents. Lenovo would be a great fit, as the company seeks to expand out of China, and could give a great base for the email warriors. Someone once said to me, "BlackBerry will always show the world what smartphones can do". That's still true, but it sadly proves that it's not just innovation that wins, it's timing too.